After spending the first two weeks of the winter season on the road, the North Marion swim team got the opportunity for a home meet of sorts on Friday at the North Marion Invitational. 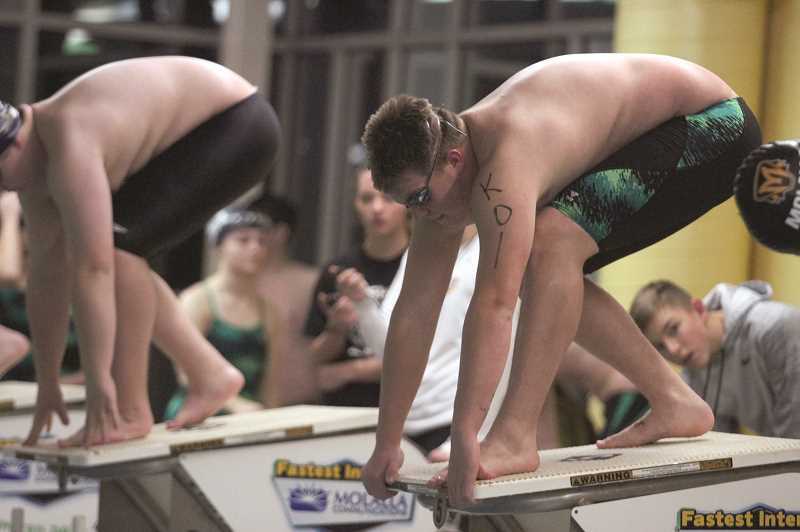 Though the invite was located at the Molalla Aquatic Center and included the Molalla Indians among the field of teams, the Huskies were running the show. Led by Ben Netter, Logan Grabill-Brown and Pascal Powers-Leach, the North Marion boys and girls teams each placed third overall, while the visiting Kennedy Trojans added a fourth-place finish in the boys competition. Netter made his lone race of the day count for the Huskies, picking up a first-place finish in the 100-yard butterfly. Though his finishing time of 1:07.46 was off his season-best mark of 1:06.26, it was still enough for a comfortable margin of victory of nearly three seconds over runner-up Trent McQuaid of Marist. Likewise, teammate Grabill-Brown also needed just one race to make his mark, placing first in the 100 breaststroke with a season-best time of 1:17.12, barely edging out Molalla's Zachary Ferrell by just 0.05 seconds. In total, the North Marion boys placed nine swimmers individually, and added three more top-five finishes in the team relay events. 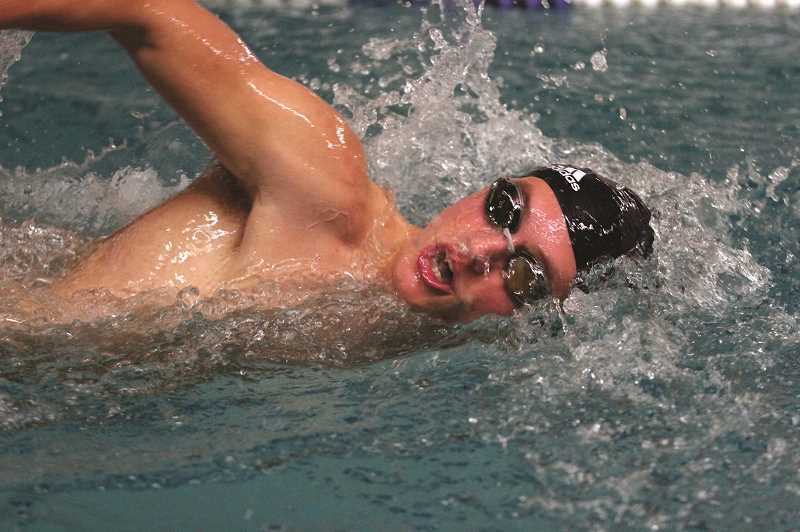 Lucas Toth, coming fresh off a pair of victories at Scappoose's River City Invitational a week before, could not repeat the magic in front of a home crowd, placing second to Marist's Chris Allender in the 100 freestyle. Though Toth beat his previous season best in the event by more than a second with a time of 52.50, Allender just beat him out at the finish line with a time of 52.20. Toth's second-place finish was one of three runner-up placements for the Huskies, who did so twice more in the 200 and 400 freestyle medleys. Mauricio Verastegui (100 back), Jason Cano (200 IM) and Tate Durst (500 free) added fourth-place victories in their events, while Brendon Rogers (500 free), Calvin Sahlin (100 breast) and Hudson Walker (50 free) each picked up fifth-place finishes in their respective events. The boys also added a third-place finish in the 200 team medley, giving the Huskies a third-place finish of 38 points behind Molalla (69) and Marist (65). For the girls, Powers-Leach led the way with a team-best second-place finish in the 500 freestyle, finishing in 7:46.09. She added a fourth-place finish in the 200 IM in 3:10.64, shaving more than 11 seconds off her previous best. Teammate KaiLee Jones was the only other member of the North Marion girls team to finish with two individual top-five placements, placing third in the 100 breaststroke in 1:34.05 and fifth in the 50 freestyle in 32.17. Alexia Hall added a fourth-place finish in the 200 freestyle, while Marissa Colby placed fifth in the 100 freestyle. In the team races, the North Marion girls each placed third in the 200 medley, 200 free and 400 free races. Kennedy junior Nick Riedman led the Trojans with the team's lone top-five finish, placing third in the 200 freestyle race in 2:43.90 and netting three points in the team standings to give the Trojans a tie for a fourth-place finish with Riverdale. Riedman added an eighth-place finish in the 100 freestyle. For the girls, Caitlyn Kleinschmit led the way with a pair of sixth-place finishes in the 50 and 100 freestyle races. The girls' 200 freestyle team of Caitlyn Kleinschmit, Kelsey Kleinschmit, Alex Waynment and Barbora Pejsova added a fourth-place finish as well. The Trojans were without lead swimmer Jacob Miller, who previously picked up a pair of first place finishes in the 200 and 500 freestyle races at the Kroc Center Invitational in Salem on Dec. 8.